Children with poor self-beliefs often have bombarded themselves for so long with a steady stream of derogatory messages. Their potential for success is greatly limited, because they don’t believe in their capabilities. Self-talk is a critical part of how children acquire beliefs about themselves. One of the most powerful ways to help your youngster develop a firm belief in himself is to teach him to practice positive self-talk. If he learns the skill now, he’ll use it forever. But what if you have a child who is a pessimistic thinker or has gotten into the habit of saying negative self-statements? Don’t despair, there are strategies you can use to turn negativity around. Here is an example of how I helped a mom and dad turn their child’s negative thinking around and develop more positive inner dialogues. Six months after Jose appeared to adjust to his new school, the eight-year-old suddenly began protesting he didn’t want to go to school and complaining he had no friends. His mom noticed how often he reacted to situations by saying, “I can’t,” or “why bother?”, as though he assumed he’d fail. Jose’s teacher confirmed he was using the same negative self-talk at school. His teacher and parents agreed that Jose’s new pessimistic attitude would be disastrous to his self-beliefs as well as to his learning, behavior and social competence. But what could they do? Jose’s teacher suggested that the parents call me for a visit and we arranged a time. I observed Jose, talked with his teacher’s and then chatted with his parents. It was obvious that Jose’s self-esteem was taking a steep decline due to his negative self-talk and beliefs. I explained to his parents the importance of children’s positive self-talk, and its potential to enhance self-confidence. I then offered six ideas that would help switch Jose’s negative thinking into more positive self-statements. I stressed that change takes time, but if they were consistent and encouraged Jose, change would happen. We spent time reviewing each strategy. His parents decided to try the ideas, even though they knew it would take time and hard work. I stressed that they should try only one new idea at a time and provide many opportunities for Jose to practice the strategy so it would become a habit and he would finally be able to use it without their reminders. A few weeks later, when Jose’s teacher called to say he seemed so much happier, was trying harder, and even making friends, the parents realized their efforts had actually paid off. Jose’s new behavior meant one thing: he was developing a more positive picture of himself. But the real golden moment came when I met with the family. Jose was the one who admitted the change, “No more stinkin’ thinkin’,” he said. “Now I catch myself!” Believe me, all four of us were wearing big smiles that day. Helping a child break the habit of using negative self-talk is not easy. Like trying to break any habit, you’ll need to be consistent in your efforts to help change your child’s behavior usually for a minimum of three weeks. Here are the six ideas I suggested Jose’s parents use to help their son develop a more positive self picture and reduce his negative self talk. Recognizing that kids learn much of their self-talk from listening to others, Jose’s parents deliberately began saying more positive messages out loud so Jose would overhear them. One day his mom said, “I love the recipe I used today. I’m really liked how it turned out.” The same day his dad’s said: “I like how I really stuck to my ‘To Do’ list today and finished everything I’d planned.” At first they felt strange affirming themselves, but when they noticed their son praising himself more, they overcame their hesitancies. Whenever someone in the family said, “I can’t,” they learned to say to the person: “Success comes in cans, not in cannots.” The simple little slogan became an effective way of encouraging family members to think more positively. To remind Jose negative talk was not allowed, they created a private signal of pulling on their ear whenever he said a negative comment in public. The family developed a rule to combat negativity they called: “1 Negative = 1 Positive”. Whenever a family member said a negative comment, the sender must turn it into something positive. If Jose said, “I’m so stupid.” His parents encouraged him to say something positive: “I’m pretty good at spelling.” Consistently enforcing the rule gradually diminished Jose’s use of negative statements. They also taught Jose to reduce his self-defeating talk by helping him learn to say positive phrases instead. It’s best to help your child choose only one phase and help him practice saying the same phrase five or six times a day until he learns it. Here are a few: • I know I can do it. • I can handle this. • I have confidence in me. • I’ll just do my best. The technique took awhile for Jose to feel comfortable using, but gradually his comfort level increased as he slowly erased his negative thinking patterns. Remember, change is possible but it takes consistent effort and a good plan. 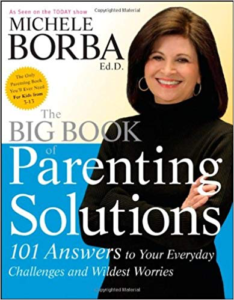 For more ideas on developing positive self-beliefs refer to the chapters on Pessimism, Fears, Sensitive, Depression, and Worrying About the World in my book, The Big Book of Parenting Solutions. You can also follow me on twitter @MicheleBorba.